n a normal spine, vertebra align perfectly on top of one another. Healthy discs, facet joints, and ligaments maintain this proper alignment of the bones. However, in certain individuals, the bones do not properly align. When this happens, and a vertebra slide forwards or backwards in relation to the vertebra next to it, the result is a mismatch known as spondylolisthesis. Spondylolisthesis can cause immense back pain because the involved joints (discs and facets) are unstable, leading to accelerated wear and tear (arthritis of the spine). In addition, the misaligned bones can cause pressure on nearby nerves, leading to radiculopathy, and sciatica. 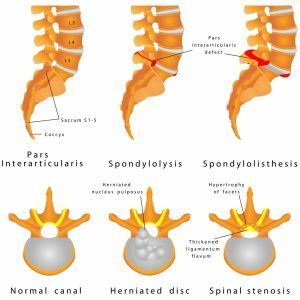 Most cases of spondylolisthesis are caused by the aging process and weakening joints and ligaments that hold the spine together. 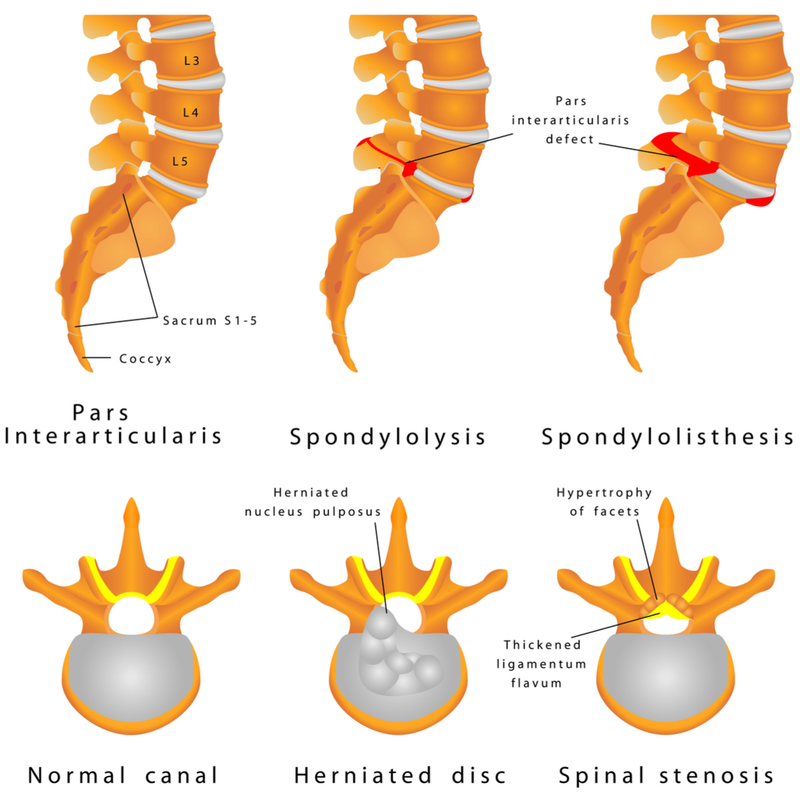 Individuals with birth defects or spine injuries are also susceptible to spondylolisthesis. In addition, spondylolisthesis can occur during adolescent development, particularly if the body grows too quickly. In addition, even young athletes can suffer from this condition as constant overstretching and impact cause wear and tear on the spine. There are various treatment options depending on the severity of each patient’s case. Taking frequent rest periods between activities, and avoiding overly strenuous exercise can greatly lessen painful symptoms. Also, chiropractic or osteopathic manipulation can help to loosen joints. Epidural steroid injections are an option for more severe cases. Epidurals have been proven to help alleviate pain and improve function in up to 50% of spondylolisthesis cases. Though symptoms of this condition can be managed non-surgically, when neck pain and back pain is disabling, patients look to surgery to support and alleviate the pressure of the affected area of the spine. The spine experts of North Jersey Spine Group will diminish the symptoms and slow the effects of spondylolisthesis. Through evaluation and compassion, NJSG doctors determine the most effective treatment plan for each patient. Elite care is provided by board-certified neurosurgeons who are spine surgeons, physiatrists, pain management physicians and physical therapists. Patients across northern New Jersey spanning Bergen County to Sussex County including the towns of Montclair, Garfield, and Hackensack, NJ, are encouraged to contact North Jersey Spine Group today.